Turing’s father, Julius, worked for the Indian Civil Service in British India. During their childhood years, Alan and his older brother stayed with a retired Army family while their parents traveled between Hastings, England, and India. He showed an interest in mathematics and science from an early age, but his headmaster was not impressed with his abilities in these fields. While studying at the Sherborne School, Turing became friends with Christopher Morcom, whose premature death turned him into an atheist who believed that all phenomena in the world must be materialistic. In 1931, he enrolled at King’s College, University of Cambridge, to study mathematics. By 1935, as a result of his thorough research in probability theory, he was elected a Fellow at King’s College. He also earned his Ph.D. in mathematical logic at Princeton University in 1938 under the direction of American mathematician Alonzo Church, who supported his work and recommended it for publication. In 1936, Turing published a seminal paper entitled On Computable Numbers, with an Application to the Decision Problem, which proposed an effective method for establishing the provability of mathematical statements. Both Turing and Church independently showed that even logical systems (weaker than arithmetic systems) are undecidable. One of their arguments consisted in the fact that lambda-definable functions are the same as all effectively calculable (computable) functions. To prove this fact, he invented the Turing machine for optimum computability. In 1948, Alan Turing was appointed Reader at the University of Manchester (Mathematics Department) while continuing his abstract work in mathematics. His main contribution at Manchester University was his design for the programming system of Ferranti Mark I, the first commercially available electronic digital computer. In 1951, he was elected for life Fellow of the Royal Society for his substantial contribution to the improvement of natural knowledge, including mathematical biology (mathematical modeling and representation of biological processes, using various applied mathematical techniques). Turing was also the recipient of the Order of the British Empire for his significant code-breaking work (with the aid of his code-breaking machine known as the Bombe) during World War II, having helped in decoding more than 84,000 intercepted messages per month. 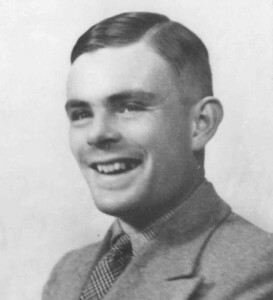 In March 1952, Turing was charged with indecency for acknowledging a homosexual relationship, which was illegal in Britain at that time. Turing pleaded guilty and was convicted. He was given the choice of probation on the condition that he underwent one year of hormonal therapy to decrease his libido. Soon after, Turing passed away at the age of 41, on June 7th, 1954, in Wilmslow, Cheshire, England. The cause of death was cyanide poisoning, according to the post-mortem examination. A half-eaten apple was found near his body (he had a fascination with the plot of the fairytale Snow White and the Seven Dwarfs) and, because it had been suspected that his sudden death was not accidental, the coroner held an inquest which confirmed that he had committed suicide. His body was cremated at Woking Crematorium, where his ashes were also scattered.